Ichiran now has a location in Times Square for its solo slurping. 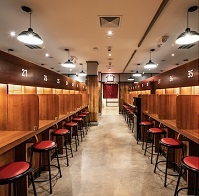 The chain, with more than 70 restaurants worldwide, is known for its tonkotsu ramen and mini cubicles where diners can focus on the flavors without any distractions, although at this location the dividers are collapsible for groups. The Times Square location also mirrors Ichiran's signature restaurants in Japan while paying tribute to the 1960s with bright red paper lanterns and windows meant to look like rice paper in a bi-level space. Ichiran's Tonkotsu ramen uses Hakata-style thin noodles made fresh daily and served in a broth made from filtered water and pork bones. Ichiran is also known for its Spicy Red Sauce made with togarashi peppers slow-cooked with more than 30-different spices. Toppings include marinated pork loin, kikurage mushrooms, dried seaweed and soft-boiled eggs. A section of Japanese beers, teas and sodas are also available.